You have a store on the market and you are selling a particular product which comes in different sizes and values. There are other stores with similar products. What will you do to survive? What is that you need to do? This is not a story about watermelons or similar kind of market products, this is a story about your company and jobs that you sell to attract the right talent. In order to be successful, you have to have great Employee Value Proposition (EVP)! An Employee Value Proposition is about defining the essence of your company; about what makes it unique and what it stands for. It encompasses the central reasons that make people proud and motivated to work there, such as an inspiring vision or a distinctive culture. When integrated into all aspects of a business, a strong Employee Value Proposition will help to retain top performers and attract the best external talent. Employee Value Proposition means creating a balance of rewards and recognition in return for an employee’s performance at the workplace. It is a people-centered approach that is focussed on existing employees and integrated manpower planning strategies because it comes from existing employees themselves. It must be original, unique, compelling and strategically focussed on a talent pool. Companies should try to build an image of being unique brands in the eyes of their future employees. This essentially means developing a statement about 'why the total work experience at their organization is superior to that at other organizations'. EVP needs to be communicated in all hiring efforts of the organization. It may be reflected on the company’s website, job advertisements and letters extending employment opportunities. However, Hudson RPO and HRO Today’s recent survey, carried out on 324 global HR executives, has shown that only 33.2% of companies have a defined EVP. 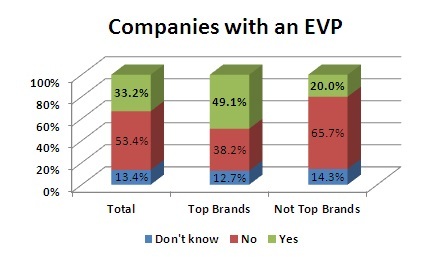 When comparing the behavior of Top Employer Brands versus “Other” Employer Brands, we see a more significant difference with nearly half of Top Brand companies having a defined EVP versus only 20.0% of Other Brands. Most of the challenges are real but the benefits are huge! High EVP is a key marketing tool and enables employers to attract the right talent while preventing their best ones from leaving. Today’s competitive markets make you fight with others on so many levels. 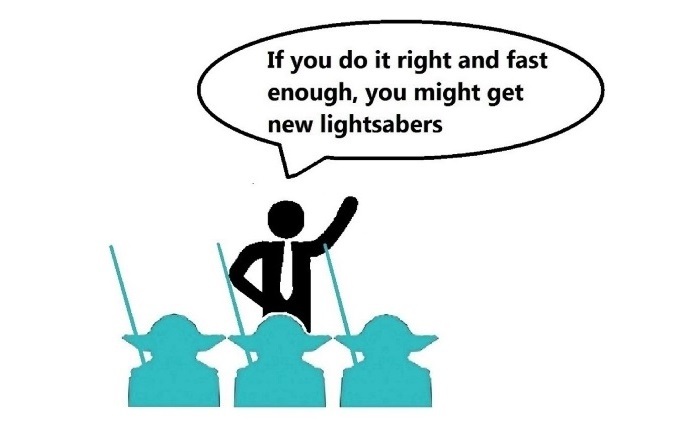 In order to keep the store open you should look at your employees as Jedi knights! Recruitment marketing software are many modern recruiters' favorite tools for finding, attracting and reaching out to best job candidates. Since talent sourcing is becoming harder and harder every year, many HR professionals say that their jobs have become unimaginable without a help of a recruitment marketing software. Here, I am not talking about an Applicant Tracking System, but rather a Recruitment Marketing solution that can help you automate, fasten and improve your efforts in finding and hiring qualified candidates. Solutions offered by a recruitment marketing tool are numerous, and choosing one is not an easy task. The very fist, and most important step is to identify your recruiting goals and challenges before buying a recruiting software. Schedule a free, personalized demo and let our experts help you!